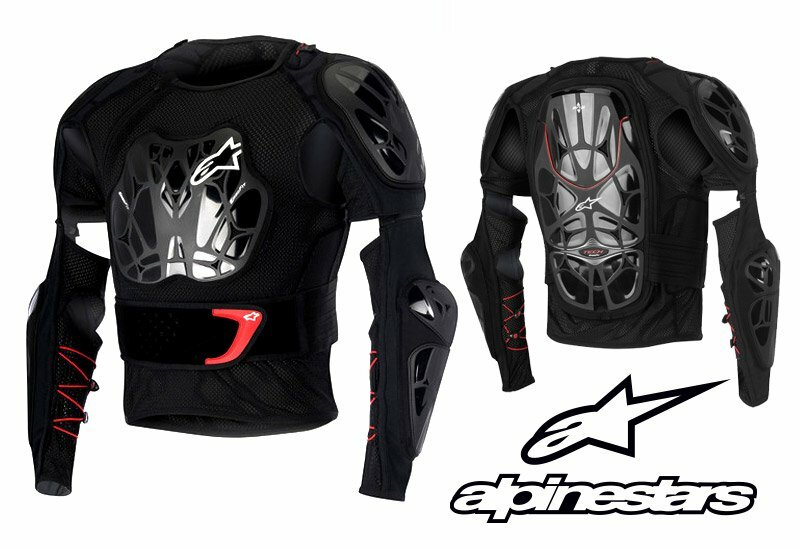 Alpinestars motocross armour with rib protection panels & BNS compatibility. Bionic Plus Jacket: Ultra lightweight and highly ventilated, the Bionic Plus Jacket features an advanced stretch mesh construction for a secure, comfortable fit. Tested by multiple Dakar winner Marc Coma, this armoured jacket is at the lower price end of the Bionic collection. With every component striving for protection and comfort at a price you can afford, the Bionic Plus is compatible with the Alpinestars Bionic Neck Support. Protection from the track: The back, shoulders and elbows are CE Certified at Level 1 giving you the protection you need on a rugged ride. However if you're looking to perform back flips, why not take a look at the Alpinestars Bionic Pro or Bionic Tech Jackets that are more pricey but offer you more protection in chest armour and Level 2. The back panel has been newly designed so it features a triple-layer, perforated EVA compound padding for good shock absorption and comfort. Both the upper chest and back padding can be removed to allow for the integration of Alpinestar's BNS. Comfort features: The main construction has been formed with a technical, elastane stretch mesh that is highly breathable and retains its shape. The underarms and arms have reduced material in order to give better ventilation and for weight saving. The thermoformed kidney protector padding gives you more comfort and the silicone printed logos help to keep the jersey in place.